The Web site for the newspaper covering the neighborhoods of West Somerville. Send your news tips to: thepowderhouse@yahoo.com. If you want to advertise call: (617) 326-7757. Growing up, war imagery surrounded him, from green plastic toy army men and G.I. Joes to World War II movies, and that imagery infiltrated his art. The “War, Madness, and Delusion” art exhibit, which runs until April 15 at the Andover Newton Theological School in Newton, features artwork from Stearns and 32 other artists that deals with the ideas and imagery surrounding war. Exhibit curator James Herbert said he came up with the idea for this art exhibit about four years ago, during the early stages of the Iraq War. About 67 artists, from Somerville to Australia, submitted pieces. Herbert, along with Rev. Karl Gustafson, pastor of the Clarendon Hill Presbyterian Church, and two others helped select the featured pieces. The one work in the exhibit by Stearns, a painting entitled “Atomic Veteran,” uses mostly black and red to depict a crouched-over man in a green army helmet surrounded by mountains and an ‘apocalyptic’ red sky, he said. “That piece came from a couple of dreams I had,” Stearns said. At the time he created the piece, he said he was reading a book about nuclear testing conducted with soldiers during the 1950s. In addition, the exhibit also features the work of fellow Somerville artist Katherine Martin Widmer. 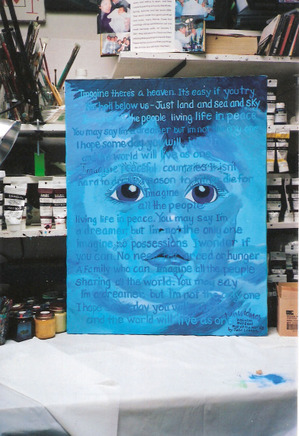 Widmer’s featured piece, a painting she started about four years ago entitled ‘Imagine That,’ depicts a baby’s face painted blue with some of the lyrics of John Lennon’s song ‘Imagine’ transcribed over it. Widmer said she was painting the piece one Saturday afternoon in the same room as some of her art students. She then asked one teenage pupil to print out the lyrics of the song. Instead, a tall quiet students of hers, a man named Oscar originally from Guatemala, stood up and began to sing the entire song, she said. “At the end of it, everyone had tears in their eyes, including me,” Widmer said. She said the theme of war is featured prominently in her work. Widmer said she first began to develop her current ideas about war during the late 1960s. Since then, Widmer said she had been involved in numerous antiwar efforts, from marching in front of armed National Guardsmen during the 1968 Democratic Convention to creating anti-nuclear weapons pamphlets during the 1970s. Two other pieces Widmer submitted for consideration for the exhibit featured images and themes relating to the first Gulf War and other violent events over the past 15 years. “This is a subject with a long history in my heart,” she said. This is the time of year when many people dear to me are bottoming out in their annual struggle with depression. It strikes early—as early as late November—and may be momentarily disrupted (or exacerbated) by the light and color and levity of the holidays. At least, there are usually other people around to distract us from the voices in our head telling us how bad things have gotten, cycling through the viciousness of isolation, depression, isolation, depression, with a little shame thrown in for good measure. But then the trudge through January, February, March…and April is the cruelest month, at least according to T.S. Eliot. The good news for those with bad blues is that the stigma surrounding mental illness, and depression in particular, is not what it once was. We make cracks about going into therapy to undo what our parents wrought, and compare notes on our prescription medications. And yet we become more and more aware of the multitudes among us living with depression, anxiety, or worse. Is the problem growing? Or is it merely that we live in this densest of cities, and therefore live with very little privacy, and have ever-larger social circles? So inevitably we notice when our roommate sleeps till 3 in the afternoon, or our coworker has shallow scratches on her arms from cutting, or our blind date is panting and looking pale. It’s enough to make one, well, depressed and anxious. There have been very few tests to my religious faith. I suppose I’ve been through as much as your average 30-something straight white American woman, and been able to reconcile all my trials with the idea of a God who is good and wills the best in all situations. But when I see people I love struggle day after day, do the right things, eat the right things, visit the right therapists and take the right meds, and still feel hopeless and helpless, or want to end their lives, it makes me want to turn my back on God. Just what place do depression and other challenges to mental health have in what Jesus has called the Kingdom of Heaven—if God is in charge, what business does He or She have letting these gatecrashers in? Is God responsible for smiting certain people with suicidal depression, or crippling social phobias, or schizophrenia? Or are the individuals themselves responsible for not being able to get out of bed, or hold a job, or talk with strangers? If they tried harder, could they not be well? To blame it on God is to yank out the thread holding the fabric of our faith together, a belief in a God who loves us and wants us to be whole. But to blame the individual is to further disable someone already crippled by self-doubt. This dilemma puts us, to paraphrase Cab Calloway, between the devil and the deep blue funk. There are various accounts of mental illness in the New Testament Gospels. Although they happened to be called exorcisms. Jesus encounters a man with “an unclean demon” in the synagogue at Capernaum, as he is teaching. Later, a wild man meets the disciples at a cave in the Gerasene countryside; he is the neighborhood crazy and the people are terrified of him. Still later in the gospels, a father brings his son, who has violent fits, to Jesus, seeking relief. Demons were a relatively new concept in first century Israel; belief in them had crept in from neighboring cultures. Not everybody believed in them, but they did serve to explain why some people’s behavior was so unpredictable, and dangerous to themselves or others—the kind of behavior we moderns now know as severe mental illness. An impromptu quartet in Davis Sq. On Feb. 3 in Davis Sq. four artists meet together for the first time to collaborate as a group for the general public. "You never know what you are going to get on the street," said Mike Greenstein, from the band Emergency Broadcasters. "I would always rather a collective over an ego experience." Greenstein, who described his band as a mixture Americana fusion and Indie, also teaches a class on Jazz at the Cambridge Adult Education Center, he said. Greenstein said he hopes to make music more accessible in the Somerville area. "I want to make changes in this area, find a way to play later in a city that has rigid laws on what time bars close," he said. This collective of musicians consisted of a mixture of artists who were all working on separate projects, some were friends, and others were meeting for the first time. 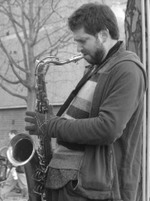 Ryan Alvanos, currently working on a solo project, brought friends Julia Shaw and Marine Dallance to assist him with percussion, and to meet up with Greenstein and friend Raleigh Green in the park outside of Store 24. Alvanos and Greenstein, friends and collaborators of this impromptu quartet, both share a passion for getting the community involved in the thriving and diverse local music scene, he said. Alvanos will be featured at Razzi's on Feb. 16, and you can check out Emergency Broadcasters at http://www.myspace.com/emergencybroadcasters. 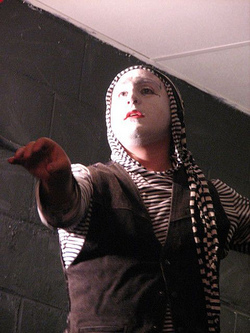 At Willoughby and Baltic, on Feb. 9th, Ian Thal performed an evening of mime, poetry, and masks. “People should come for the Don Quote experience” said Ian Thal, an actor, poet, and mime performer. 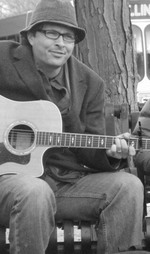 Thal said his journey becoming a performer started with poetry, as he developed his voice and began attending open-mics. Later, Thal was introduced to William J. Barnum, who taught him the art of mime. “That is when I started to incorporate acting, poetry and mime in my performances,” he said. After learning from Barnum, Thal worked with another teacher of mime, James Von Looy. Together they collaborated to create the Cosmic Splunker, which Thal said is still an ongoing concern. Thal’s last performance was several months ago, in which time he has taken classes, refined his skills, and create new material, he said. Thal said the time he puts into the performances are well worth the effort. “He fits in well,” said Meredith L. Garniss, the owner of Willoughby and Baltic. Developers outlined their plans to build a condominium building at the old CARLI fence site at Newberne Street and Morrison Avenue at the Davis Square Task Force meeting Feb. 11in front of about 45 community members. 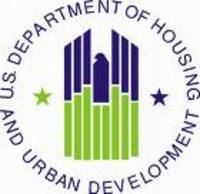 As of now, the developers, who purchased the site last May, plan on including 12 units, with six one-bedroom units and six two-bedroom units. The building will have three floors and a mezzanine level, with 20 parking spaces on the first floor. Some residents raised concerns about the building’s parking spaces, as the current plan has the spaces next to a bike path. The building’s initial plans included underground parking, along with 16 units, including lofts, and a different exterior design. When Ward Six Alderman Rebekah Gewirtz first saw the initial designs, she said she voiced concerns over the building’s density and its exterior, which she said looked too industrial. After the meeting about five weeks ago, the architect and developers redesigned the building to have fewer units and to make the building’s façade have a more contemporary feel. “That’s the representative of the Ward; we’ll go back and make the [recommended] changes,” Nick Ianuzzi, the project’s attorney, said. With four less units, the underground parking had to be scrapped as it was now not economically feasible. “This is still a work in progress in terms of parking,” Ianuzzi said. Some residents such as Ron Newman raised concerns that the above-street parking would take away from potential green space and provide an eyesore on the bicycle path, asking the developers to scale back the number of parking spaces. “There’s an unfortunate byproduct to that [redesign] and that is parking by the bike path,” Gewirtz said. She said she had not seen the redesign before the Task Force meeting. The developers can legally reduce the number of available spaces if the building is within 1000 feet of the Davis Square T station. However, other area residents such as James Campano said he wanted the building to include parking spaces to reduce the number of cars parked on surrounding streets. Residents also raised concerns about the building’s environmental impact. The building’s architect said it is too early in the planning process to discuss ways to make the building more environmentally friendly, but construction could include pervious pavement that would allow water to seep into the soil, along with a potential drainage system on the roof that would slowly release rainwater into the soil. In addition, developers plan on conducting shadow studies to determine the sun’s effect on the building in the near future. Representatives with the site said they are still 12 to 24 months away from groundbreaking at the site. After the developers spoke, Krista Kranyak, the owner of Ten Tables Restaurant in Jamaica Plain outlined her plan to purchase Antonia’s on Holland Street. She said the sale is mostly complete, but that she needs a wine and beer license to be profitable at the site. While Antonia’s Restaurant had a wine and beer license, the license did not transfer in the sale. Instead, the license transferred back to the city. “This deal is basically dead if I don’t get the license,” Kranyak said. Ten Tables is one of seven restaurants vying for two licenses. The three-member license commission will decide how to distribute the licenses next week. Afterwards, area resident Trish Blain, who purchased Sacco’s Bowl Haven, announced at the meeting that she will hold a community meeting Feb. 20 at the Dilboy VFW post to discuss her plans for the site. We are truly honored to represent you on the Ward 7 Democratic Committee over the next 4 years. As progressive Democrats, we are committed to keeping the committee and our party open, honest, and accessible. Our campaign's success reaffirmed the power of grassroots organizing through educational outreach, personal contacts, and a positive message of reform. We want to work with the other members to re-energize the committee by holding regular meetings that address real issues such as bringing the Green Line extension to Somerville, keeping Somerville affordable for families, making government accessible, and improving the quality of education. There is still much work to do to increase awareness about the ward committee since many people either have not heard of it before or are not familiar with its role as the local grassroots organizing body of the Democratic party. Please join us on March 10th when ward committee members from across Somerville will be organizing for the city committee at 7pm at the VNA, 259 Lowell Street. Congratulations to all newly elected and re-elected members of our Ward 7 Democratic Committee! Read more about Somerville's City Democratic Committee at www.SomDems.org and the MA Democratic Party at www.MassDems.org . Rachel Heller 617-395-6642 Rachel.Heller@gmail.com 11 Elmwood St.
Nave Gallery will host a closing reception on Feb. 9 from 3 to 5PM for the “Be a Villen” exhibit, showcasing the work of 17 young local artists and writers dealing with adverse issues affecting Somerville youth. Over 100 people visited the gallery on the exhibit’s first night, witnessing works addressing issues such as death, drugs and gentrification. “The theme of this show is a little disturbing,” Wendy Weiser, Somerville Program Director for Teen Empowerment, said. 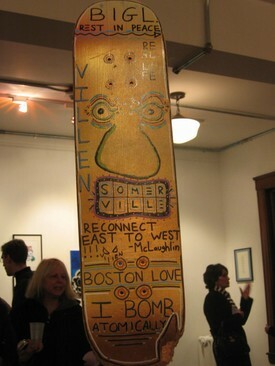 Teen Empowerment, along with ARTSomerville, helped coordinate the Villen exhibit. “I didn’t think [the works] would be so close to home,” Anna Rodriguez, a youth organizer with Teen Empowerment, said. The exhibit was dedicated to Brian Liberatore, a Somerville resident who died last October. The exhibit featured multiple works dedicated to Brian, along with works done by Brian and his brother Scotty Liberatore. “The whole thing is keeping his memory alive,” Danny McLaughlin, Teen Empowerment Program Coordinator, said. McLaughlin had six photographs featured in the exhibit. Brian Liberatore had two of his drawings displayed, including one in memorial of deceased Somerville resident Matty O’Brien. Brian Liberatore came up with the idea of a Villen, a young person who grew up in and embodied Somerville, after seeing the “townie” shirts in Charlestown, where townie is Charlestown’s Villen equivalent, McLaughlin said. About five years ago, Brian Liberatore designed a shirt that featured a stylized face and the word ‘Villen’ on it. After seeing the original shirt, Steven Morris, another featured artist, said he liked the original design and designed another shirt of the same design but with different colors with Brian, he said. The exhibit displayed the two original Villen shirts. Zadak Rice, another featured artist who displayed his art on a skateboard, said Brian came up with the idea for the face on the villen shirts one time when he and Brian went out spray painting. He said the idea for the face drawn on the skateboard came from the same excursion. In addition to the face, Rice included on the skateboard a coaster from a bar he used to frequent with Brian. He also wrote on the board a quote Brian once told him when they out job-hunting that stuck in his head. “Skateboard’s not big enough for everything he told me,” Rice said. The exhibit also featured an interactive piece, where people could write their thoughts on Brian and others on a section of the wall. The wall included a quote from a poem Mark McLaughlin wrote for Brian. A pair of Brian’s cowboy boots sat near the bottom of the interactive piece. “Brian just had a sneaker collection that was ridiculous,” Danny McLaughlin said. 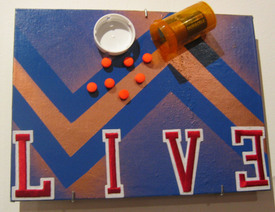 One of Morris’s pieces, entitled “LIVE=EVIL,” deals with drug addiction. ARTSomerville Director Susan Berstler and her neighbor, Scotty Liberatore, began planning the exhibit about two months ago, after a string of untimely deaths. The largest piece at the exhibit is a photograph mural done by Morris and Scotty Liberatore that they submitted, but was not chosen, as part of the Davis Square T station mural competition. The mural included photos of people and landmarks around Somerville. Standing on a concrete pillar in Davis Square under gray skies, a Tufts freshman holds up a blue Barack Obama poster for passing traffic. “I’ve gotten a lot of really enthusiastic honks,” Obama volunteer Chelsea Brown said. Brown and Laura Hicks, a fellow Tufts freshman and Obama campaign volunteer, campaigned for Obama for about two hours in Davis Square, holding a sign and passing out five pounds worth of flyers, she said. Later in the day at the same location, four women held up signs by Holland Street to support Hilary Clinton. Down the street, biomedical engineer Justin Klekota passed out flyers promoting his group’s campaign in Ward 7 for Democratic Ward Committee. 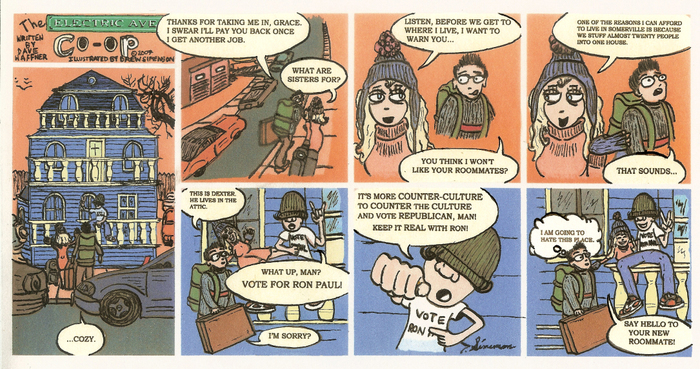 Klekota and others hit the streets to pique voter interest on Super Tuesday, Feb. 5, as Massachusetts, along with 23 other states, held its presidential primary. Due to the large number of states holding primaries and caucuses, election results from the Super Tuesday primaries could help establish frontrunners in each party for the upcoming presidential election. Election clerk John Alibrandi, who worked the polls at the Engine Six Fire Station in Teele Square, said the polling place had a steady stream of voters all day, with over 700 out of about 1500 registered voters in the precinct voting by 5:20 p.m.
“There are a lot of people who are making a point to vote,” he said. Of the first 700 votes cast in Ward 7 Precinct 2, Alibrandi said he estimated that 600 of then were for the Democratic primary, with no ballots cast for the Green-Rainbow Party or the Working Families Party. Despite early rain, election workers at the fire station said 300 voters had voted by 8 a.m.
“I think we’re getting a high percentage turnout,” election worker Jude Shabry said. Voter Susan Maldonado said this primary has received more interest than past primaries, and that she plans on staying up late to find out about the election results. Voter Amy Checkoway said she also plans on staying up late to hear the results. “People feel like it matters more,” she said. As of Tuesday night, early results indicated that Hillary Clinton won Massachusetts’ Democratic primary and former Governor Mitt Romney won the Republican primary. 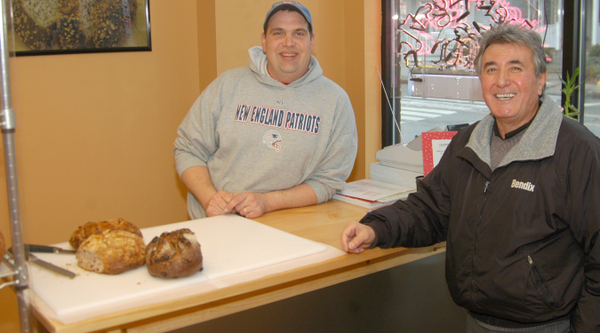 Super Bowl 2008: Super disappointment around Davis Sq. Mayor Joseph A. Curtatone and the Office of Strategic Planning and Community Development announced Feb. 1 that in addition to several key Small Business initiatives and programs, small business owners may now also receive 'Business Welcome Kits' in four major languages. Originally introduced in April 2007, the popular kits are now available in Portuguese, Spanish, and Haitian-Creole. Since their development, more than 250 kits have been distributed citywide to small business owners and entrepreneurs. As part of the Business Development Initiative, the city has also instituted small business loan programs, a Storefront Improvement Program, and a recent partnership with ACCION USA, for access to capital through the program. The business kits, in all four languages, may be ordered by visiting City Hall at 93 Highland Avenue, through the Somerville Chamber of Commerce, or via the city website: www.somervillema.gov. For more information, please contact the Office of Strategic Planning and Community Development at 617-625-6600 ext 2500. On Jan. 21 the Human Rights Commission and the Early Childhood Advisory Council celebrated the legacy of Martin Luther King Jr. for the sixth year at the Somerville High School. “Somerville embodies Dr. King’s values.” said Mayor Joseph A. Curtatone. “Instead of just tolerating our differences, the city realizes the potential greatness in our differences,” said Curtatone. Each year, the Human Rights Commission and Early Childhood Advisory Council honor one individual and one organization for their dedication to promoting Dr. King’s values in and around Somerville during the previous year, he said. The Community Action Agency of Somerville (CAAS), which advocates for opportunities and resources for low-income residents in the city, was chosen as the organizational recipient, he said. The individual award went to Somerville resident Danny McLaughlin, who works for Teen Empowerment in Somerville as a youth advocate. Also included in the celebration was a keynote address from Representative Byron Rushing, Suffolk County Ninth District. “We are commemorating the whole movement that was not led by just one man,” said Rushing. “The FBI thought Dr. King was dangerous, and he was dangerous to people who wanted others to be put down. We need to become that kind of dangerous,” he said. High school senior Jessica Dias also spoke about the inspirations that Martin Luther King Jr. left as his legacy. “Love and expectance is what binds us. Not religion or age or ethnicity. All anyone needs is heart,” she said. “Dr. King’s lasting legacy of hope and equality remains directly relevant to life in our diverse and multicultural community,” said Curtatone. The event was co-sponsored by the HRC and Advisory Council, in partnership with the Somerville Public Health Department and the Somerville Public Schools. Aesthetics and elites: What accounts for good taste? On Jan. 15 the Philo café met at McIntyre and Moore Booksellers to discuss the topic of ‘Aesthetics and Elites’ that revolves around the art world. “Elites have misjudged the greatness of artists for years,” said Reginald F. Mckeen, a regular at the Philo Cafe. Daniel T. Gewertz, another Philo participant and free lance writer, said the style of art has changed, but the format that reports the artistic issues has not. “The format needs to change with the style of art,” Gewertz said. “Elitist serve a temporary purpose in our society,” said Carolyn M. Muskat, a new member at the Philo Café. “I don’t want to wait until I am dead to find out what I missed. They expose us to the art and then we come with our own expectations and opinions,” said Muskat. “The elitists are tuned up on their aesthetics and can see a certain beauty that the majority of people might not understand,” said Clark. The Philo Café meets again on the third Tuesday, Feb. 19th. One Davis Square property owner is striving to keep the district a story center for shoppers and diners by bringing in high quality tenants he believes will be here for the long term. Poutahidis said he is very pleased to have all new tenants in four of the five storefronts at his property at 378 Highland Ave.: KickAss Cupcakes, a gourmet cupcake and pastry shop; The Green House, a florist; Al Fresco, an Italian restaurant and the newest entry, When Pigs Fly, a boutique bakery, which opened Dec. 8. It started when he arrived in Boston in 1969 and took a job pumping gas at the then Citgo station on northern Massachusetts Avenue, he said. In 1971, he bought the gas station business. In 1974, he bought two taxi cabs, under the name Chris and Cara, for himself and his then wife. Poutahidis is single with no children. For the last 20 years, Poutahidis has been taking care of his 101-year-old father, who he brought to Somerville when his mother died in 1988. Ward 4 Alderman Walter Pero, Alderman-at-Large Bill White, Brian, Danny DaCova, Alderman-at-Large Dennis Sullivan, new owner Michael DaCova and family members Amanda DaCova, Tony, Colleen DaCova, Alderman-at-Large Jack Connolly, Ward 1 School Committee Member Maureen Bastardi, Ward 1 Alderman Bill Roche, and Ward 7 Alderman Bob Trane officially reopened the Paddock Restaurant, under new ownership, with a ribbon cutting ceremony on Wednesday, January 2nd. 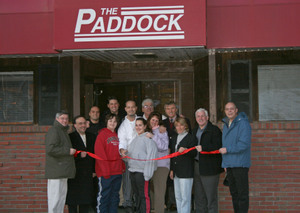 Located at 249 Pearl Street in Gilman Square, the Paddock recently received an internal facelift, as well as a menu upgrade. The restaurant is open daily, beginning at 11:00 a.m.
Mayor Joseph A. Curtatone announced Jan. 3 that 15 programs, administered by seven organizations, serving Somerville’s homeless population have been awarded a combined total of $1.9 million by the U.S. Department of Housing and Urban Development through the McKinney Continuum of Care awards. The total funds are significantly more than the $1.4 million received in the previous round of funding. "We here at Shelter are thrilled that the Stepping Stones Program has received this grant money," said Gordie Calkins, program manager for Shelter Inc., "We will use the funds to provide Case Management and Permanent Supported Housing to medically needy homeless individuals. Working with other organizations and the City of Somerville, we are making concrete progress on ending homelessness in this city." Members of the Somerville Police Department’s Traffic Unit are honored by the Board of Aldermen on Thursday, December 13th for receiving the Department’s 2007 Community Service Award. The SPD gives the award annually to individuals who have 'significantly enriched the quality of life among the citizens of the community and by promoting the ideals of community service,' he said. The Traffic Unit is comprised of Lieutenant Dennis Silva, Sergeant James Rooney, Officers James Brown (retired), James Hodgdon, Richard Gilberti, Thomas Ahearn, Steven Johnson, William McCarthy, Michael Wyatt, and Patricia Elpidoforos. 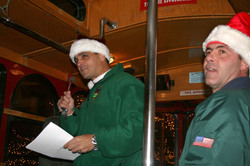 The Arts Council’s 11th annual 'Illuminations Tour' drew a record crowd of over 1,000 people on Saturday, Dec. 15th, forcing the addition of an extra trolley this year. “The Illuminations Tour has rapidly become one of the most popular holiday celebrations in the city,” said Executive Director of the Arts Council Greg Jenkins. “This year’s turnout was terrific, and is a great reminder of the strong community – both arts and otherwise – we have here in Somerville. Thanks to the many Somerville families that decorate their homes so beautifully, and make this tour possible," said Jenkins. The Illuminations Tour included a 45-minute trolley ride through the Union Square and Central/Winter Hill neighborhoods, with refreshments and entertainment at Somerville City Hall before and after each tour, said Jenkins. If you were unable to attend the Illuminations Tour, you can pick up a $3 Illuminations Tour map at McIntyre & Moore Booksellers in Davis Sq. (255 Elm St.). For more information on the Illuminations Tour and other Arts Council events, please call the Council at 617-625-6600 ext 2985. Somerville Cares About Prevention (SCAP) Director Tammy Freitas da Rocha announced Dec. 14 the launch of a new youth group, Somerville Positive Forces 100 (SPF100). "We are here to represent the youth who are facing issues of peer pressure and addiction. We are here to help,” said Youth Leader Deepika Bhargo. The group was created with the mission of supporting social change that would empower youth to make healthier decisions regarding the use of alcohol, tobacco and other drugs, said Freitas. SPF100 consists of a diverse group of teen members from across the city, including Penina Azard, Deepika Bhargo, Linda Chau, Mitchell Freitas, Manish Lama, Ashley McCarter, Jacky Man, Talia Mosley, Ashlee Snell, Suzanne Styffe, Amy Wu. Staff supervisors include SCAP Youth Advisor Lovelee Heller and CASPAR, Inc. Youth Advisor Brian Rich. “I am working with SPF100 because I want to see positive changes in our community” said Ashley McCarter, SPF100 Youth Leader. The youth group will meet every Tuesday and Wednesday from October through June to develop projects aimed at reducing destructive decisions among Somerville youth through educating, advocating, and mentoring, said Freitas. SPF100 youth leaders will organize and participate in ongoing MADD Youth In Action projects such as Sticker Shock, Shoulder Tap Surveys, Alcohol Purchase Surveys and Compliance Checks in efforts to reduce youth access to alcohol, she said. “We are trying to raise awareness among youth and adults, to alert them of the issues related to drugs and alcohol that exist in our community,” said SPF100 Youth Leader, Linda Chau. “It is the vision of SPF100 to create a community where youth are seen as assets and have access to a number of opportunities and experiences that foster human potential and leadership, thus preventing destructive decisions and behaviors,” said SCAP Youth Advisor Lovelee Heller. SPF100 enacted their first campaign, the Sticker Shock campaign, at four local liquor stores, and will be working on Alcohol Purchase Surveys and Public Service announcements from December to March in efforts to raise awareness of the minimum drinking age of 21, said Freitas. During the campaign, Somerville youth will work with local merchants to put special stickers on beers six-packs and cases, wine cooler and other alcohol multi-packs and on liquor store bags, she said. Somerville Liquor Stores may sign up to participate in the Sticker Shock Campaign by contacting Lovelee Heller at 617-625-6600 x 4322. For more information on Somerville Positive Forces 100 or Somerville Cares About Prevention, please contact Tammy Freitas da Rocha at (617) 625-6600, ext. 4319. The Saragas Eye & Laser Center, in the spirit of the holiday season, is offering FREE eye examinations for eyeglasses to the uninsured. We are offering examinations on Friday, December 21, 2007 at 413 Highland Ave. (Davis Square) Somerville, MA 02144. I urge readers to call us at 617-623-1900 to make an appointment.